On July 7th Hospital CEO Brad Smith and Director of Emergency Services and Medical Surgery Carrie Tressler were presented with the Premier Hospice Bridges Award. 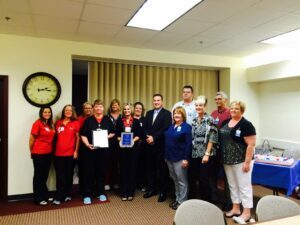 The award was presented by Premier Executive Director Jolene McLaughlin at Rush Memorial Medical Pavilion located at 110 East 13th St, Rushville, IN. 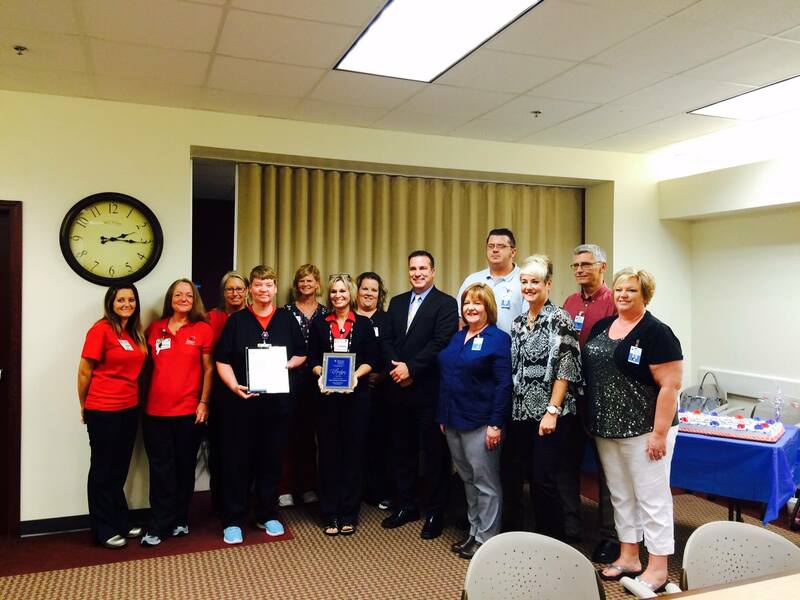 “This award is presented to a hospice partner that has made a strong commitment to excellence in end-of-life care,” said McLaughlin. The facility was selected because they recognize patients who are hospice appropriate, educate their patients and their families on the hospice benefit, and work well as a team to coordinate care with hospice for their patients. Rush Memorial Hospital, a part of the Rushville community from more than 65 years realized a couple of years ago there was level of care they wanted to expand more fully to service their patients. Brad Smith CEO indicated, “Rush Memorial Hospital is more than a healthcare facility; we are a community partner and leader in rural health. “ With this in mind Rush began working with Premier Hospice in June of 2014, to offer a General Inpatient level of hospice care within the hospital as well as coordinate hospice services within the community. One example of the collaborative partnership that has developed between Rush Hospital and Premier Hospice is a discussion with patient Henry G who was coping with end stage lung disease. Henry and his family were overwhelmed by the thought of discussing hospice because they didn’t want to think about him being in the last stages of the disease process. However Rush Hospital’s Discharge Planner Janie Manning suggested an informational meeting because Henry’s symptoms were increasing dramatically, and she realized how difficult this was becoming for him and his family. After meeting with Premier and the Rush staff, Henry’s wife Priscilla stated, “We felt more informed about the changes that had been happening with his condition and the care he would be receiving at home.” “The transition into hospice services was smooth and helped lessen the stress on both Henry and I,” stated Priscilla. Since being admitted to Premier Hospice in February of this year, Henry was readmitted to Rush Hospital for two short General Inpatient stays to manage the severe anxiety associated with lung disease and returned home.